ElecForU FBA_4331903089 - X1f49c; best compatibility:Plese see the details in discription. X1f49c; intelligent protection system:it adopt mcu microprocessor Control so that Products all have sound over-charge, over current, over discharge, over-temperature, over voltage protection functions such as stable performance. X1f49c; usb output function&with car charge: it could charge any of your your usb device, HTC, meanwhile, Samsung, like Apple, huawei, tablets, other USB Powered or other 5. 0v output digital devices, this charger come with car charge cable which means you will need not to worried about your device out of juice. X1f49c; replaceable battery panel ：the battery panel is removeable so that it suit for most of the lithium battery, you just need change the different battery panel for charging other lithuim battery. NP-F970 USB Dual Digital Battery Charger for Sony NP-F550 NP-F570 NP-F750 NP-F770 NP-F930 NP-F950 NP-F960 NP-FM55H NP-FM500H NP-QM71 NP-QM91 NP-QM71D Camera - X1f49c; package included: 1 x dual battery charger, 1 x AC Charger, 1 x car Charger, 1 x User Manual, 2 x Removable Battery Panels. Customer support E-mail: [email protected] Com 【compatible battery model np-f330/np-f530/ np-f550/ np-f570/np-f730/np-f750/np-f770/np-f930/np-f950/np-f960/np-f970/np-fm50/np-fm55h/np-fm500h/np-qm71/np-qm91/np-qm51d/np-qm71d/np-qm91d【compatible camera type of sony】sony mirrorless ilce series a6000, a5000, nex-7, slt-a37, a5100, a7r ii, nex-c5, a7s, nex-6, nex-5, nex-f3 sony slt series slt-a33, a7s ii, a7 ii, a7, a3500, a7r, a3000, nex-c3, dsc-s cyber-shot pro series dsc-s30 dsc-s50 dsc-s70 dsc-s75 dsc-s85 sony dsc-f cyber-shot pro series dsc-f707 dsc-f717 dsc-f828 sony mvc-cd mavica series mvc-cd200 mvc-cd250 mvc-cd300 mvc-cd350 mvc-cd400 mvc-cd500 dslr-a100α100 dsc-r1 sony ccd-trv hi8series ccd-trv106k ccd-trv108 ccd-trv116 ccd-trv118 ccd-trv128 ccd-trv208 ccd-trv218e ccd-trv228 ccd-trv308 ccd-trv318 ccd-trv328 ccd-trv408 ccd-trv418 ccd-trv418e ccd-trv608 ccd-trv730 dcr-dvd201 dcr-dvd300 sony dcr-pc minidv series dcr-pc100e dcr-pc101 dcr-pc101e dcr-pc101k dcr-pc103e dcr-pc104e sony dcr-trv minidv series dcr-trv6e dcr-trv8e dcr-trv10e dcr-trv11e dcr-trv17e dcr-trv18e dcr-trv19e dcr-trv20e dcr-trv22e dcr-trv22k dcr-trv25e dcr-trv27e dcr-trv30e dcr-trv33e dcr-trv33k dcr-trv38e dcr-trv39e dcr-trv50e dcr-trv70e dcr-trv80e dcr-trv140e dcr-trv230e dcr-trv240e dcr-trv250e dcr-trv330e dcr-trv340e dcr-trv350e DCR-TRV530E DCR-TRV730E DCR-TRV740E DCR-TRV830E DCR-TRV840E DCR-TRV950E Sony Video Walkman GV-D1000 Sony DCR-HC88 Sony NEX Series NEX-3, SLT-A55 And more models. Any question please don't hesitate to contact us. DSTE FBA_DASY03A2 - In the box: - 2x brand new battery - 2 years warranty work for: - ccd-rv100 - ccd-rv200 - ccd-sc5 - ccd-sc5/e - ccd-sc55e - ccd-sc55 - ccd-sc6 - ccd-sc65 - ccd-sc7 - ccd-sc7/e - ccd-sc8/e - ccd-sc9 - ccd-tr1 - ccd-tr11 - ccd-tr1100e - ccd-tr12 - ccd-tr18 - ccd-tr18e - ccd-tr1e - ccd-tr2 - ccd-tr200 - ccd-tr205 - ccd-tr215 - ccd-tr2200e - ccd-tr2300 - ccd-tr2300e - ccd-tr280pk - ccd-tr290pk - ccd-tr3 - ccd-tr300 - ccd-tr3000 - ccd-tr3000e - ccd-tr3100e - ccd-tr311e - ccd-tr315 - ccd-tr315e - ccd-tr317 - ccd-tr3200e - ccd-tr3300 - ccd-tr3300e - ccd-tr411e - ccd-tr412e - ccd-tr413 - ccd-tr414 - ccd-tr415e - ccd-tr416 - ccd-tr417 - ccd-tr417e - ccd-tr425e - ccd-tr427 - ccd-tr427e - ccd-tr500 - ccd-tr511e - ccd-tr512e - ccd-tr515e - ccd-tr516 - ccd-tr516e - ccd-tr517 - ccd-tr555 - ccd-tr57 - ccd-tr610 - ccd-tr617 - ccd-tr617e - ccd-tr618 - ccd-tr618e - ccd-tr640e - ccd-tr67 - ccd-tr710 - ccd-tr713e - ccd-tr716 - ccd-tr717 - ccd-tr717e - ccd-tr718 - ccd-tr718e - ccd-tr728 - ccd-tr728e - ccd-tr730e - ccd-tr76 - ccd-tr760e - ccd-tr810e - ccd-tr818 - ccd-tr840e - ccd-tr845e - ccd-tr87 - ccd-tr910 - ccd-tr913e - ccd-tr917 - ccd-tr918 - ccd-tr918e - ccd-tr930 - ccd-tr940 - ccd-tr97 - ccd-trv15 - ccd-trv16- pt-176s, yn168, yn308, yn860, yn300 air, yn600l ii, oe-160c, yn1410 - l116t, vl40t, oe-160, cn-216, yn1200, yn300 iii, yn600 rgb, cn-160, jyled-500s, l132b, cn-576, cn-304 - yn160 iii, l132t, yn760, jyled-300s, vl162t, yn300, yn608, yn300 ii, yn600s, yn600 air, yn360, yN900, YN216, YN608 RGB, VLS50B Battery Type : Li-ion. Output voltage : dc 8. 4v max/ DC 7. 2v mean. High capacity for Stamina. Battery capacity : 58. Powerextra 1006587 - High capacity for Stamina. Info function for Life Indication. It has no memory effect or other negative effects in recharging. Powerextra offers a 30-day money back policy, 12-month limited guarantee against manufacturing defects from date of purchase. Utmost pre-sale and after-sale customer services are also guaranteed.
. 100% compatible with the sony dcr-vx2100, hdr-fx1000, dsr-pd150, hvr-v1u, hvr-z1u, hvr-z1p, hdr-fx1, hdr-fx7, hxr-mc2000u, nex-fs100u, nex-ea50uh, mvc-fdr1, hdr-ax2000, hvl-lbpb, dsr-pd170, hvr-hd1000u, fdr-ax1, NEX-FS700U Handycam Camcorder. Upgraded li-ion rechargeable battery 7. 4v 8800mah, np-f930, ultra-high capacity replacement battery for Sony NP-F970, NP-F950, NP-F960 . Powerextra 2 Pack Replacement Sony NP-F970 Battery Compatible with Sony DCR-VX2100, DSR-PD150, DSR-PD170, FDR-AX1, HDR-AX2000, HDR-FX1, HDR-FX7, HDR-FX1000, HVL-LBPB, HVR-HD1000U, HVR-V1U, HVR-Z1P - Fully decoded, you can check the remaining capacity, shutter count and recharge performance on the cameras power source info screen. High grade digital battery with advanced lithium technology ensures maximum battery life and power. Output voltage : dc 8. 4v max/ DC 7. 2v mean. Compatible with the following sony handycam camcorders: - ccd-rv100 - ccd-rv200 - ccd-sc5 - ccd-sc5/e - ccd-sc55e - ccd-sc55 - ccd-sc6 - ccd-sc65 - ccd-sc7 - ccd-sc7/e - ccd-sc8/e - ccd-sc9 - ccd-tr1 - ccd-tr11 - ccd-tr1100e - ccd-tr12 - ccd-tr18 - ccd-tr18e - ccd-tr1e - ccd-tr2 - ccd-tr200 - ccd-tr205 - ccd-tr215 - ccd-tr2200e - ccd-tr2300 - ccd-tr2300e - ccd-tr280pk - ccd-tr290pk - ccd-tr3 - ccd-tr300 - ccd-tr3000 - ccd-tr3000e - ccd-tr3100e - ccd-tr311e - ccd-tr315 - ccd-tr315e - ccd-tr317 - ccd-tr3200e - ccd-tr3300 - ccd-tr3300e - ccd-tr411e - ccd-tr412e - ccd-tr413 - ccd-tr414 - ccd-tr415e - ccd-tr416 - ccd-tr417 - ccd-tr417e - ccd-tr425e - ccd-tr427 - ccd-tr427e - ccd-tr500 - ccd-tr511e - ccd-tr512e - ccd-tr515e - ccd-tr516 - ccd-tr516e - ccd-tr517 - ccd-tr555 - ccd-tr57 - ccd-tr610 - ccd-tr617 - ccd-tr617e - ccd-tr618 - ccd-tr618e - ccd-tr640e - ccd-tr67 - ccd-tr710 - ccd-tr713e - ccd-tr716 - ccd-tr717 - ccd-tr717e - ccd-tr718 - ccd-tr718e - ccd-tr728 - ccd-tr728e - ccd-tr730e - ccd-tr76 - ccd-tr760e - ccd-tr810e - ccd-tr818 - ccd-tr840e - ccd-tr845e - ccd-tr87 - ccd-tr910 - ccd-tr913e - ccd-tr917 - ccd-tr918 - ccd-tr918e - ccd-tr930 - ccd-tr940 - CCD-TR97 - CCD-TRV15 - CCD-TRV16 Battery Type : Li-ion. 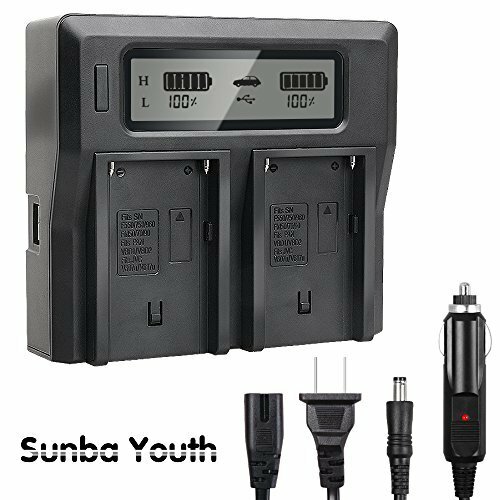 SR SUN ROOM 4331982268 - Package includes: 2x np-f970 battery battery compatible: sony np-f975, np-f750 charger compatible: sony bc-vm10, trv815 dcr-sc100 dcr-tr7000 dcr-trv7, np-f975, np-f960, trv67, np-f570, np-f960, trv210 dcr-trv310, trv820, trv91, np-fm50, trv85, trv95, vx2100 fdr-ax1 gv-d200, trv75 ccd-trv81, d700 hvl-lbpb hdr-ax2000 hdr-fx1, np-f770, tr555 ccd-tr716, np-fm500h, bc-vm50, trv57, trv65, z1u, trv88 ccd-trv90, trv98, np-f950, tr87 ccd-tr516, trv315, trv525 dcr-trv720, trv520, trv46 ccd-trv51, tr930, trv87, z5u, trv110, trv215, trv82, trv120, hd1000u hvr-v1u, trv615, trv715, bc-v615 sony np-f550, np-f970, trv130, np-qm1, np-f750, np-fm55h, np-f970, trv93, trv66, trv99 ccd-trv101, trv9, trv68 ccd-trv72, trv37 ccd-trv41, z7u hxr-mc2000u hxr-nx5 nex-ea50uh nex-fs100u, tr940 ccd-tr3000 ccd-tr3300 ccd-trv15 ccd-trv25 ccd-trv36, sc65 ccd-tr67 ccd-tr76, tr818 ccd-tr910, trv900 dcr-vx2000, trv58 ccd-trv62, tr917, np-qm91 compatible the following Sony models: CCD-SC55, TRV510, TRV320, NP-F770, TRV43, FX7 HDR-FX1000, FS700U Note: 1. High quality, Long Lasting and Manufacture Price. The battery 100% decoded and 100% Compatible with the Original Cameras and Chargers. High capacity. Battery capacity : 58. 5wh/7900mAh. Info function for Life Indication. Use high quality Japanese Cells for longer battery life with no Memory Effect. Use integrated Japanese microchip which can prevent the overcharge and overdischarge. Neewer [email protected]@##1 - Premium material and multi-use: made of excellent quality aluminum alloy showing simple elegant appearance; Can be placed directly on the light stand, ground or desk, providing multiple shooting solutions, more convenient for your creation work. Power source: power adapterincluded or NP-F550 NP-F970 Li-ion batterynot included.
. Style:led lightNote:Battery Not included. This bi-color, high cri 96+ leD light has lower lumin compared to single color LED light. High capacity for Stamina. If you prefer higher lumin lighting, please refer to our single-color LED light. Descriptions:with its lightweight and durable construction, you can carry this light around with you wherever you go. Neewer 2 Packs Professional Metal Bi-Color Dimmable 660 LED Video Light for Studio,YouTube,Product Photography,Video Shooting,Durable Metal Frame,with U Bracket and Barndoor,3200-5600K,CRI 96+ - Features with color temperature knob, can adjust the color temperature from 3200K to 5600K. White filter can make soften the light source and enhance skin tone in portraits photography. Adjustable u mount bracket makes the light toward different angle for the best shooting. Provide light control with four leaf barn doors. Keep stray light from other areas of the subject from reflecting into the camera lens and causing flare. Specifications:led beads: 660 pieces330 white+330 yellowvoltage: dc 12-15vinput voltage: 100-120vpower: 40wcolor temperature: 3200-5600KCRI: >=96Power Source: Power Adapterincluded or NP-F550 NP-F970 Li-ion Batterynot includedBattery Output: DC 14. 8vsize: 232x200x48mmlumen: 3360 lux/meterpackage contents:2 x dimmable lED Video Light2 x White Diffuser2 x Power Adapter2 x Power Cable2 x Carrying Bag Battery Type : Li-ion. DST Electron Technological Co., Ltd DASY02A2 - U-mount bracket: enables the photographers to adjust the lighting angle according to the shooting environment. High capacity for Stamina. In the box: - 2x brand new battery 2 years warranty work for: - ccd-rv100 - ccd-rv200 - ccd-sc5 - ccd-sc5/e - ccd-sc55e - ccd-sc55 - ccd-sc6 - ccd-sc65 - ccd-sc7 - ccd-sc9 - ccd-tr1 - ccd-tr11 - ccd-tr1100e - ccd-tr12 - ccd-tr18 - ccd-tr18e - ccd-tr1e - ccd-tr2 - ccd-tr200 - ccd-tr205 - ccd-tr215 - ccd-tr2200e - ccd-tr2300 - ccd-tr2300e - ccd-tr280pk - ccd-tr290pk - ccd-tr3 - ccd-tr300 - ccd-tr3000 - ccd-tr3000e - ccd-tr3100e - ccd-tr311e - ccd-tr315 - ccd-tr315e - ccd-tr317 - ccd-tr3200e - ccd-tr3300 - ccd-tr3300e - ccd-tr411e - ccd-tr412e - ccd-tr413 - ccd-tr414 - ccd-tr415e - ccd-tr416 - ccd-tr417 - ccd-tr417e - ccd-tr425e - ccd-tr427 - ccd-tr427e - ccd-tr500 - ccd-tr511e - ccd-tr512e - ccd-tr516 - ccd-tr517 - ccd-tr555 - ccd-tr57 - ccd-tr610 - ccd-tr617 - ccd-tr617e - ccd-tr618 - ccd-tr618e - ccd-tr640e - ccd-tr67 - ccd-tr710 - ccd-tr713e - ccd-tr716 - ccd-tr717 - ccd-tr717e - ccd-tr718 - ccd-tr718e - ccd-tr728 - ccd-tr728e - ccd-tr730e - ccd-tr76 - ccd-tr760e - ccd-tr810e - ccd-tr818 - ccd-tr840e - ccd-tr845e - ccd-tr87 - ccd-tr910 - ccd-tr913e - ccd-tr917 - ccd-tr918 - ccd-tr918e - ccd-tr930 - ccd-tr940 - ccd-tr950e - ccd-tr97 - ccd-trt97 - ccd-trv101 - ccd-trv15 - ccd-trv16 - ccd-trv16e - ccd-trv201 - ccd-trv215- pt-176s, oe-160c, cn-576, yn300 ii, yn300 air, yn1410 - l116t, yn600l ii, yn1200, yn300 iii, yn600 air, yn300, yn900, vl40t, yn608 rgb, cn-216, jyled-500s, yn600 rgb, oe-160, cn-304 - yn160 iii, yn760, yn216, yn600s, cn-160, vl162t, yn308, l132b, yn608, yn168, l132t, yn360, YN860, JYLED-300S, VLS50B Battery Type : Li-ion. Battery Type : Li-ion. Output voltage : dc 8. 4v max/ DC 7. 2v mean. Use high quality Japanese Cells for longer battery life with no Memory Effect. FANSHANG - Output voltage : dc 8. 4v max/ DC 7. 2v mean. Battery Type : Li-ion. Output voltage : dc 8. 4v max/ DC 7. 2v mean. Battery not included dimension: 260*200*22mmWeight: 056kg viltrox ls-190 adjustable light Stand Material: Aluminum Max. Easy to operate with clear led digital panel screen. Wireless remote control: fsk 2. 4ghz wireless remote control system, distance up to 20 meters, great for adjusting parameters of led video light. Viltrox vl-200 3 packs led video light kit -thin bi-color led light Panel to adjust accurate color temperature3300k-5600k, brightness control 20%-100%. High quality, Long Lasting and Manufacture Price. VILTROX VL-200 3 Packs Ultra Thin Dimmable Bi-color LED Video Light Panel Lighting Kit includes: 3300K-5600K CRI 95 LED Light Panel with Hot Shoe Adapter/Light Stand/Remote Controller and AC adapter … - The battery 100% decoded and 100% Compatible with the Original Cameras and Chargers. High capacity. Battery Type : Li-ion. Premium material and multi-use: made of excellent quality aluminum alloy showing simple elegant appearance; Can be placed directly on the light stand, providing multiple shooting solutions, ground or desk, more convenient for your creation work. Power source: power adapterincluded or NP-F550 NP-F970 Li-ion batterynot included. High capacity for Stamina. Use high quality Japanese Cells for longer battery life with no Memory Effect. Powerextra 1001915 - Output voltage : dc 8. 4v max/ DC 7. 2v mean. Info function for Life Indication. Note: no Battery Included. Bi-color dimmable led video light: 96pcs3300k/96pcs5600k smd lamp beads make for the perfect lighting source. Use high quality Japanese Cells for longer battery life with no Memory Effect. Use integrated Japanese microchip which can prevent the overcharge and overdischarge. The battery include 30-day money Back and 3-YEAR Manufacturer Warranty. 660 led bulbs: with 330 white and 330 yellow led long lasting bulbs, this light illuminates a variable white balance from Tungsten-Daylight from 3200 to 5600K. Battery capacity : 37. 0wh/5000mAh. Come with a durable carrying case, convenient to carry around or for storage. Battery type: li-ion / voltage:7. 4v / capacity: 5200mAh. Replacement sony np-f750 battery for sony np-f730, np-f760, np-f750, np-f770 battery and sony ccd-trv215 ccd-tr917 ccd-tr315 hdr-fx1000 HDR-FX7 HVR-V1U HVR-Z7U HVR-Z5U Camcorder. Full coded- show battery level in camera LCD; Can charged by your original Charger and Super Long Time Recording. Powerextra 2 Pack Replacement Sony NP-F750 Battery for Sony NP-F730, NP-F750, NP-F760, NP-F770 Battery and Sony CCD-TRV215 CCD-TR917 CCD-TR315 HDR-FX1000 HDR-FX7 HVR-V1U HVR-Z7U HVR-Z5U Camcorder - Batteries are made with the highest quality li-ion cells. Work for sony camcorder models as below: - ccd-rv100 - ccd-rv200 - ccd-sc5 - ccd-sc5/e - ccd-sc55e - ccd-sc55 - ccd-sc6 - ccd-sc65 - ccd-sc7 - ccd-sc9 - ccd-tr1 - ccd-tr11 - ccd-tr1100e - ccd-tr12 - ccd-tr18 - ccd-tr18e - ccd-tr1e - ccd-tr2 - ccd-tr200 - ccd-tr205 - ccd-tr215 - ccd-tr2200e - ccd-tr2300 - ccd-tr3 - ccd-tr300 - ccd-tr3000 - ccd-tr3000e - ccd-tr3100e - ccd-tr311e - ccd-tr315 - ccd-tr315e - ccd-tr317 - ccd-tr3200e - ccd-tr3300 - ccd-tr3300e - ccd-tr411e - ccd-tr412e - ccd-tr413 - ccd-tr414 - ccd-tr415e - ccd-tr416 - ccd-tr417 - ccd-tr417e - ccd-tr425e - ccd-tr427 - ccd-tr427e - ccd-tr500 - ccd-tr511e - ccd-tr512e - ccd-tr516 - ccd-tr517 - ccd-tr555 - ccd-tr57 - ccd-tr610 - ccd-tr617 - ccd-tr617e - ccd-tr618 - ccd-tr618e - ccd-tr640e - ccd-tr67 - ccd-tr710 - ccd-tr713e - ccd-tr716 - ccd-tr717 - ccd-tr717e - ccd-tr718 - ccd-tr718e - ccd-tr728 - ccd-tr728e - ccd-tr730e - ccd-tr76 - ccd-tr760e - ccd-tr810e - ccd-tr818 - ccd-tr840e - ccd-tr845e - ccd-tr87 - ccd-tr910 - ccd-tr913e - ccd-tr917 - ccd-tr918 - ccd-tr918e - ccd-tr930 - ccd-tr940 - ccd-tr950e - ccd-tr97 - ccd-trt97 - ccd-trv101 - ccd-trv15 - ccd-trv16 - ccd-trv16e - ccD-TRV201 - CCD-TRV215 Battery Type : Li-ion. SMALLRIG 4331911719 - Kit has: 3 bi-color led video light, 3 power adapter, 3 power cable, 3 26inches-75inches Adjustable Light Stand; 3 Hot Shoe Adapter; 1 Wireless Remote Control; 1 Carry bag. Battery Type : Li-ion. High capacity for Stamina. Universality】a universal double ball head with cold shoe and 1/4'' screw on both ends.
. Info function for Life Indication. Using universal 1/4" hot shoe adapter, securely to mount on light standIncluded, camcorder or light bracket to achieve various lighting angles and heights. Advantage for lighting kit: led video light kit provide professional light from different positions. Power: 30W. 3300k yellow -5600k white bi-color, brightness adjustment 20%-100% to suit multiple shooting situations. 1135 - SMALLRIG Cool Ballhead Multi-Function Double Ballhead with Shoe Mount & 1/4" Screw for Monitors Led Light - High capacity for Stamina. Wireless remote control: fsk 2. 4ghz wireless remote control system, distance up to 20 meters, great for adjusting parameters of led video light. U-mount bracket: enables the photographers to adjust the lighting angle according to the shooting environment. Output voltage : dc 8. 4v max/ DC 7. Wasabi Power KIT-BTR-NPF960-LCH-FM50-01 - Battery Type : Li-ion. Power: 30W. 180 degree rotation】the ball mount can be easily rotated by 180 degree and secured by the side wingnut. Attaching barn doors to light sources creates a beam spread of light; Comes with a white diffusing cloth to soften the harsh light and a carrying bag to store the light and accessories. This wasabi power battery and charger kit includes 2 batteries and one charger with a European plug and car adapter. Battery capacity : 58. 5wh/7900mAh. Using universal 1/4" hot shoe adapter, securely to mount on light standIncluded, camcorder or light bracket to achieve various lighting angles and heights. Wasabi Power Battery 2-Pack and Charger for Sony NP-F975, NP-F970, NP-F960, NP-F950 - Advantage for lighting kit: led video light kit provide professional light from different positions. Info function for Life Indication. 6 groups 19 channels groups control for professional use. The lcd display screen with brightness color temperature, camera, any tripod, CH and battery level to clearly view. High quality, Long Lasting and Manufacture Price. The battery 100% decoded and 100% Compatible with the Original Cameras and Chargers. High capacity. Wireless remote control: fsk 2. SMALLRIG 1138 - The best load < 1. 21kg. It can mount monitor and LED Lights on the one end via 1/4'' screw. Smallrig multi-function double Ballhead with Clamp & 1/4" Screw 1138 1. Premium material and multi-use: made of excellent quality aluminum alloy showing simple elegant appearance; Can be placed directly on the light stand, ground or desk, providing multiple shooting solutions, more convenient for your creation work. Power source: power adapterincluded or NP-F550 NP-F970 Li-ion batterynot included. Come with a durable carrying case, convenient to carry around or for storage. Battery type: li-ion / voltage:7. 4v / capacity: 5200mAh. Replacement sony np-f750 battery for sony np-f730, np-f750, np-f760, np-f770 battery and sony ccd-trv215 ccd-tr917 ccd-tr315 hdr-fx1000 HDR-FX7 HVR-V1U HVR-Z7U HVR-Z5U Camcorder. 1138 - SMALLRIG Cool Ballhead Arm Super Clamp Mount Multi-Function Double Ball Adapter with Bottom Clamp for Ronin-M, Ronin MX, Freefly MOVI - Full coded- show battery level in camera LCD; Can charged by your original Charger and Super Long Time Recording. Batteries are made with the highest quality li-ion cells. Output voltage : dc 8. 4v max/ DC 7. 2v mean. 2.